I am an Orvis endorsed fly fishing guide located in Saylorsburg, PA, just south of Stroudsburg in the Pocono Mountains. 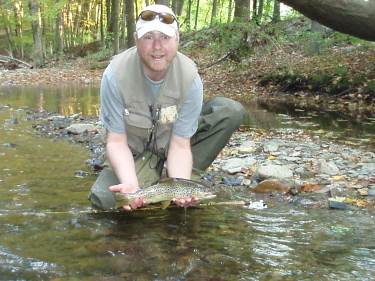 I offer guided fly fishing trips for trout in the Pocono Mountains, Northwest New Jersey and Central, PA. Take a closer look at the streams I guide through the fly fishing tab’s drop down menu, which has them broken down by region. My fly fishing trips are tailored to the needs of the individual clients skills and abilities. Guided fishing trips may be full or half days. Hand tied flies, leaders and quality balanced rods and reels and equipment are provided for all trips. Lunch is provided on full day trips. Some of the finest fly fishing waters in the USA are located here in the Pocono mountains and adjoining areas and I am very fortunate to have so many beautiful, productive streams to fly fish so close to home. The local streams are a reasonable day trip from the New York and Philadelphia areas so come out and enjoy a full or half day of fishing and go to sleep at home that same night. If you have the time and you’d like to get away for a while check out my hosted trip to Colorado. New York and Philadelphia areas.